Kristine Broome went to Trader Joe's for groceries on Thursday. 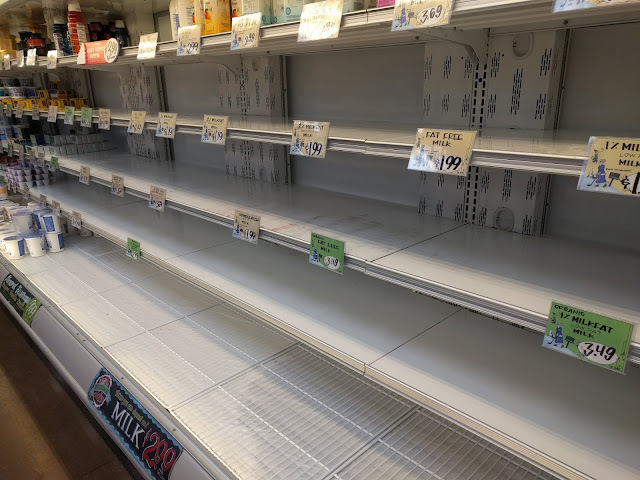 This is what the dairy shelf looked like at 7:30pm. Glad to know that everyone is taking this seriously. We just don't have experience with this kind of weather - except for those who just moved here from Montana! Everyone else did! :) crazy! Even folks from Montana would struggle due to road conditions. The reality is that our collective mindset is not set for snow or a major storm. These types of storms happen too infrequently for us to invest money in potentially unnecessary equipment (plows, blades, sand spreaders, stocked supplies like de-icer). If anything, that picture should make all of us take a hard look at our own readiness for an event with no warning. Are you and your family prepared to ride out a major storm or disaster? Do you have supplies ready or available so that you are not a net drain on a JIT (just in time) system? Are you ready to help out your neighborhood and community both for a potentially big snow event or a major disaster? If you answer no, then consider making changes so that you can help, rather than run madly to the store to "stock up" (and thereby further straining the system).